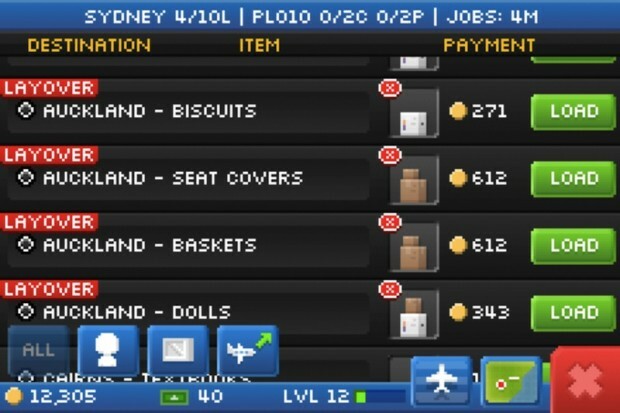 Pocket Planes by NimbleBit just released last week and has taken over the lives of so many. Telling little planes to go from one airport to another is really fun for some reason. Unfortunately, though, outside of a brief tutorial on how to make these planes move, the game doesn’t explain some of the finer details. Let’s try to rectify that problem. The following points are things that I have out together by my experience, so don’t hold them as law. Just yell at me in the comments for all of the things I get wrong. Moving planes is simple: just load them up with cargo and passengers and point them in the right direction. If you happen to fill up your plane with cargo or passengers that are going to the same place, you will get a 25% bonus to the cash you bring in. It is always beneficial to try and get a one way flight, but, of course, that’s not always possible. You can, however, help your chances out pretty easily with layovers. If you have ever sat for four hours in Denver International Airport waiting to catch a flight to LA, layovers are probably not your best friend. Luckily, in this game you don’t have to care one way or the other about the feelings of the poor people spending their hard earned money on your airline. You can lay them over forever, and they won’t care. Laying people over is indefinitely helpful for planning future direct flights. Say you have a plane that can hold two cargo items but the airport you are in has but one cargo and its destination is too far away to make the trip profitable. Instead of waiting for more jobs to show up, you might take that cargo to a nearby, larger airport anyway and lay it over. You will be taking a loss on it initially, but another plane later on has a better chance of filling up a direct flight, and the 25% bonus will make up for it. Layovers are even more valuable later on when you open up Class 2 and Class 3 airports. They act as a funneling system to get cargo and passengers to smaller airports where Class 2 and Class 3 planes cannot land. Using a larger plane, you can bring passengers from far away cities, lay them over in airports your short range aircraft can get to, and make some pretty nice change by creating direct flights. Class 1 airports can layover five things, Class 2 ten, and Class 3 twenty. Keep that in mind. Upgrading airports does two things: it allows for more jobs to show up, and it gives you more slots to layover passengers. That’s it. Do not expect the class of the airport to change. That is based on the population size only, as far as I can tell. Also, being able to upgrade all airports to Class 3 would defeat one of the purposes of layovers and eventually destroy any strategy the game has, little as that might be already. Class 1, 2, and 3 cities can be determined by the color of their dot on the map: black, blue, and red, respectively. If you don’t have any Class 2 or 3 planes, it might not be beneficial early on to try and open up those types of airports since they really only benefit the larger planes. For the $51,000 it costs to open up one Class 3 airport, you could open up a Class 1 city and upgrade it and others a few times to support more jobs. That’s all up to you, though. The game seems to scale pretty well, so when you are ready for Class 2 and 3 airports you probably are ready to buy some class 2 or 3 planes. HOWEVER, on the other hand, you could look at Class 2 and 3 airports as sound investments early on so that when you DO get a Class 2 or 3 plane they will have somewhere to go. Spending a ton of money to buy these types of airports early on could hinder you from growing your fleet and expanding to other Class 1 airports as easily, so it’s up to you. Quite a bit of confusion has come up regarding the Flight Crews in the game. Basically, this feature allows you to team up with your friends (and anyone else using the same crew name) to attempt to deliver the most jobs to the destination city featured at the time. To set this up, you and your friends just need to type in the same Flight Crew name, and that’s it. 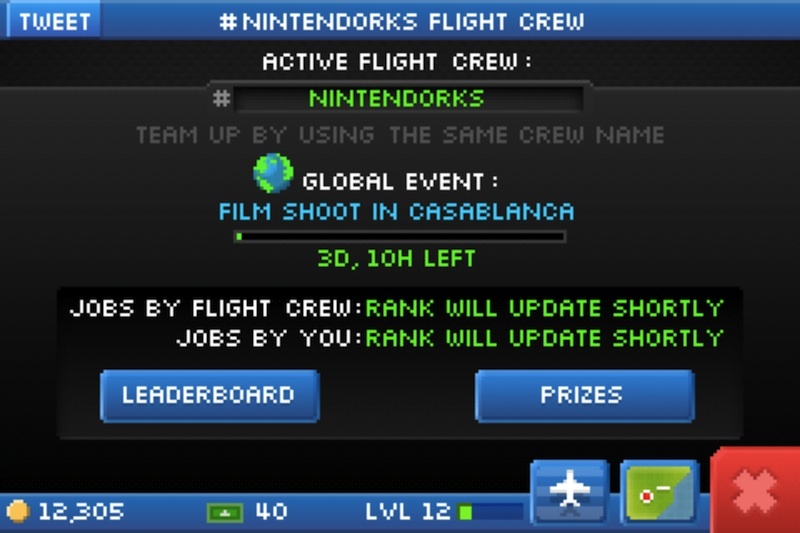 Passengers and cargo that show up as blue in your jobs list are those that affect the event at hand, and delivering these blue items will count towards your rank among your team and everyone else playing the game. The confusion that most people have is that only team members who have made deliveries to the destination city will show up on the leader board. It seems odd to do it this way, but that’s how it is currently. So don’t fret if you and your buddies are on the same crew but never see each other in the rankings. That just means none of you have delivered any blue goods. Also, you will only see the names of people you have in as a Game Center friend. Anyone else in your crew that are not friended with you this way will just show up as a number. That is also why the overall leader board will just show a series of numbers. There are two ways to get new planes, but both of them cost Bux: you can outright purchase a plane from the market or buy one of three individual parts for them. Purchasing them outright will cost you more, but is immediate. Buying the parts will cost less, but you will have to wait for them to randomly show up in the market. You can also get new parts by opening up new airports, but you never know what you will get so that isn’t the preferred method. Take note, too, about the letter behind the name of the plane: C,P, or M. These stand for Cargo, Passenger, and Mixed, and will hold only those things. The method of transporting passengers showed to you by the tutorial is to fill up your plane and tell it to fly until that full load has stopped. This is nice if you plan on putting the game aside and not worrying about it, but what if you want to interact more with the game? Waiting for several fifteen minute flights to land can get pretty boring, and once a plane passes its first stop, you now have an empty seat not making you any money on the rest of that flight. So what to do? If I am wanting to play more and fill up planes, I will not set any waypoints beyond the first one, and at each stop pick up more passengers for the next stop, creating a continuous cycle of income rather than simply going from one big route to another. For example, if I have a plane with passengers that want to go to Brisbane, Sydney, and Melbourne, coming from Cairns I will only tell my plane to stop at Brisbane. Once that passenger gets off, I will try and fill his empty seat with someone from one of the two remaining cities. 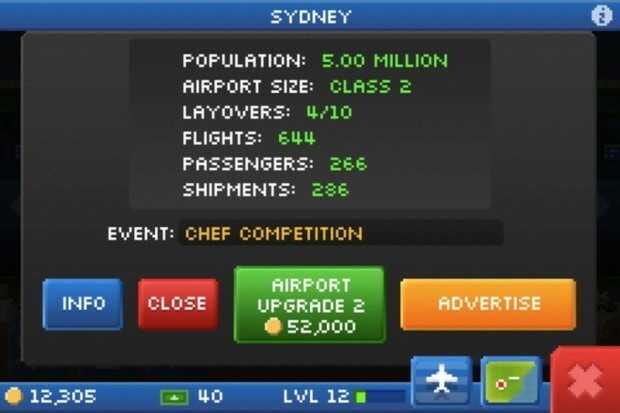 Once the plane gets to Sydney, I’ll do the same and hope that I can fill up a direct flight to Melbourne for bonus cash. It doesn’t always work out, but when it does I like to think I get more cash out of the same route than I would otherwise by setting a few waypoints and forgetting about it. Plus you get to actually play more. So hopefully this explains some things that the game assumes you already know. If I am missing anything, feel free to let me know in the comments. And have fun watching your little planes. Great info. I didn’t understand layovers at all, but now it makes perfect sense. Thanks. One correction. You have to fill the plane with passengers or cargo going to the same airport. So if you have a 8 capacity plane it takes a full plane going to the same place to get the 25%.